In this adaptation of the classic Sokoban series, Medusa has trapped characters from Japanese folklore in her castle. You play as a demon as he escapes from the castle and works his way to Medusa, freeing all of his friends. 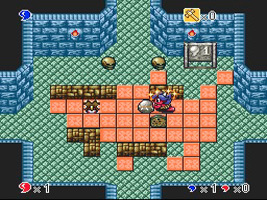 Each screen of the castle contains a block puzzle. Push the rocks and drop them all into the holes to clear each stage. As you solve puzzles you will free your friends, and they will power you up to face the boss battles. Once you're clear of the castle there are another three puzzle-sets to play on before you face Medusa herself.